Hello! 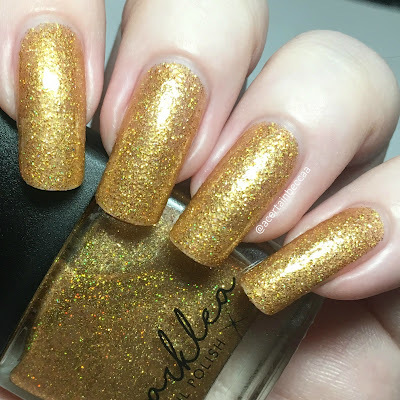 Today I have a very exciting post for you - another Sparklea Nail Polish collection! Releasing this Thursday (23rd March) is the Mer-Maid You Laugh collection. 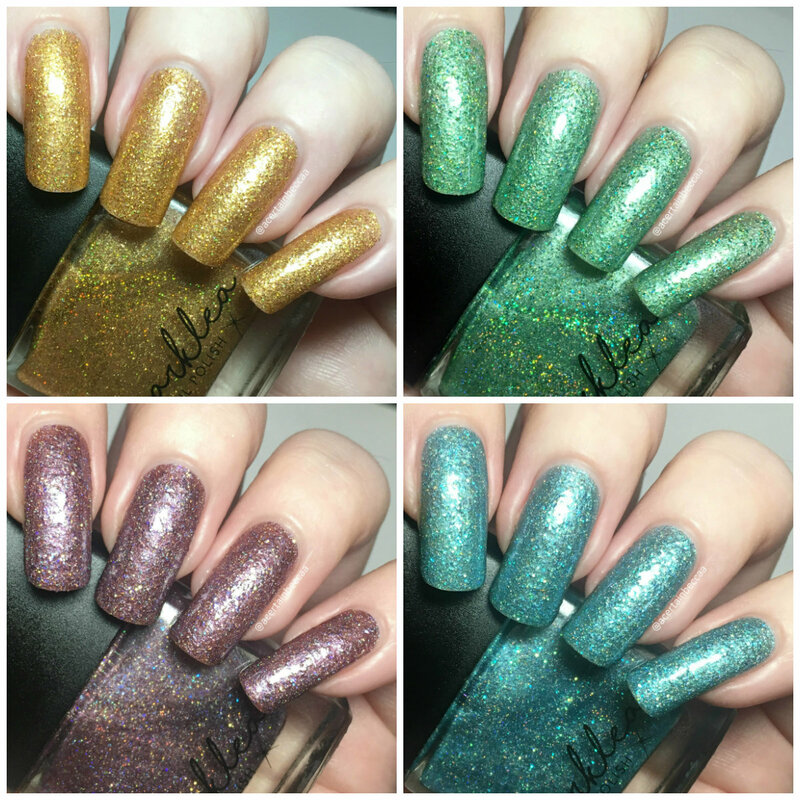 Me and Kat over at KLEnails helped name the four piece pun-filled collection, and were also asked by Lea to swatch them for you. Read on to 'sea' my full swatches, and for more info! Here's a quick look at the four mermaid/sea inspired polishes. All are clear or sheer/jelly bases packed with various glitters, and have similar formulas. They start off fairly sheer but apply smoothly, and the glitter distributes evenly without any manipulation. I've applied each in two coats, with a thicker second coat to give fuller coverage. Based on your preference, you could apply three thin coats instead. The glitters dry slightly textured but are easily smoothed with topcoat. 'Sandy Beach' is a clear base full of fine gold microglitter, and holographic gold glitter. This is a lovely bright gold without being too far on the yellow side. Below is two coats with topcoat. 'You're A Turtle Mess' is a green base with fine green microglitter, blue to green shifting glitters, and holographic glitter. This is a nice soft green that I think will suit a lot of skin tones. Below is two coats with topcoat. 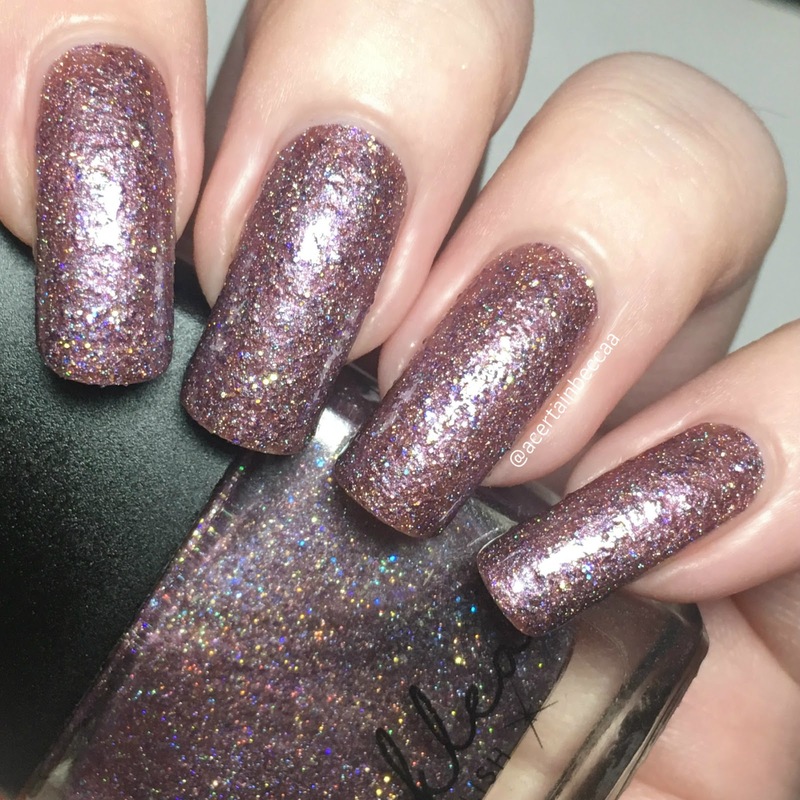 'Hold My Pursula' is a purple base with purple microglitter, purple to blue shifting glitters, and holographic glitter. For those wondering, this is a very different shade to 'Floo Powder' from the Harry Potter collection (swatched here). Below is two coats with topcoat. 'Ofishally Lost It' is a blue base with fine blue microglitter, blue to green shifting glitters, and holographic glitter. This is a surprise favourite for me, it's beautiful! Below is two coats with topcoat. What do you think? I am loving this collection, and still keep making myself laugh with the punny names! Me and Kat just couldn't 'kelp' ourselves! Thankfully I've managed to keep the puns to a minimum in this post and focus on the polish. As well as being gorgeous on their own, all four work really well for nail art. I have created a couple of themed looks which will be in Wednesday's post. 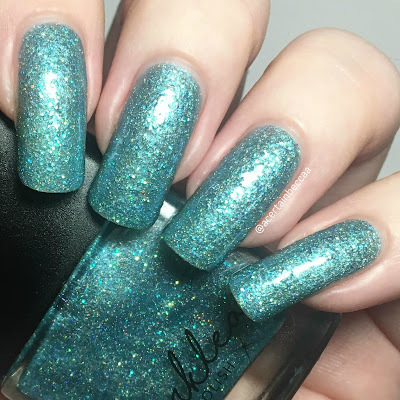 The Sparklea Nail Polish Mer-Maid You Laugh collection will be releasing on the 23rd March. You can find the Sparklea website here and Instagram here. 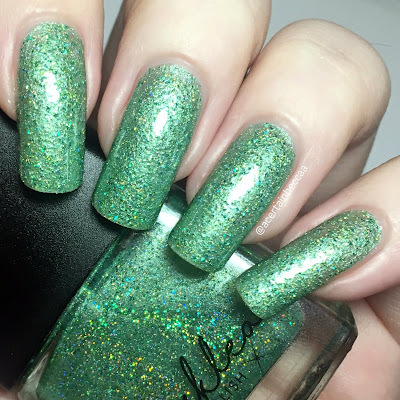 Make sure you also go and check out Kat's (KleNails) amazing swatches here.